The nearest stop to the workshop venue: UL Stables stop (see No.5 on the map below), Stop in City centre: William street. BUS line 304 runs to the UL Stables stop. BUS line 307 runs the service to Cappavilla Village, before going to the UL Stables stop. 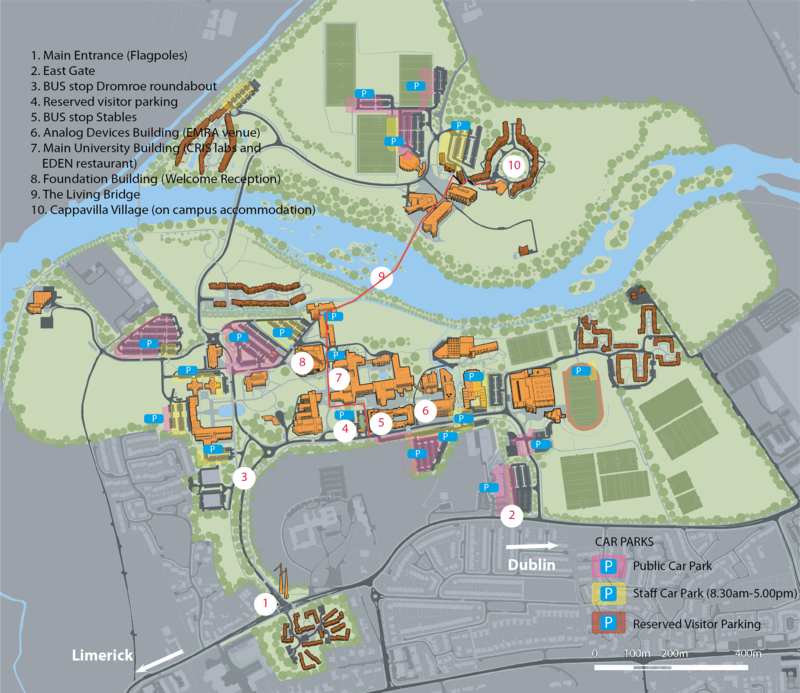 The University of Limerick is located 4 km from Limerick city centre. The nearest airport to Limerick is the Shannon Airport, located 30 km from the University of Limerick. Others Irish airports are Dublin Airport (210 km) and Cork Airport (120 km). The Shannon Airport services many destinations throughout Europe and the US. Please see the Shannon Airport website for further information. To get to the University of Limerick campus from Shannon Airport, you can travel by car, taxi, or bus. This link takes you to the map with directions to the campus. Bus Eireann runs service from/to Shannon Airport to the main Limerick City bus station, Colbert Station, Parnell Street, Limerick. This bus departs at least once every hour from the Airport and costs €8.40 one way (last update November 2017). They also run service from the Limerick City centre to UL (€2.20 one way). Please note that there is no taxi rank at the Airport, so you should ensure to book a taxi prior to your arrival. The airport taxi desk is located at arrivals hall, and they will organise an airport taxi for you. It is open for all arriving flights. If you wish to book in advance you can contact the desk directly on phone +353 61 471538. The approximate taxi fare is €45 (includes all passengers in the taxi). There is not direct connection between Dublin Airport and Limerick by train. However, there are plenty of commercial coaches going directly from Dublin Airport to University of Limerick. JJ Kavanagh–The journey time is approximately 3.5 hours and there are 8 buses each day. Dublin Coach offer services from Dublin Airport to the University of Limerick and Limerick city. This service operates to and from Dublin Airport 24 hours a day, 7 days a week. You can get a bus at Zone 16 in the airport. Coaches depart the airport every half hour with a stop at the Red Cow Luas Stop, where you need to change coach for the M7 Express Service to the University of Limerick. Prices start from €15 per person one-way. Eireagle offer 8 coaches daily from Dublin Airport to Limerick City. Citylink and Bus Eireann both offer limited services from Cork Airport to Limerick city. Please see www.citylink.ie/timetables and www.buseireann.ie for further information. The University can be accessed by car through two main entrances: the Main Entrance (near the UL Flagpoles) and the East Gate Entrance, both of which are off the Plassey Park Road. Details of car-pooling, set-down areas and parking facilities are available on the Parking Map. Travellers from some countries may need visas. A list of countries whose citizens need a visa to visit Ireland can be found at this link. Participants are advised to make their own arrangements with respect to entering Ireland. EMRA'18 organization team will provide Visa invitation letter on request. More information on Visa issue here.